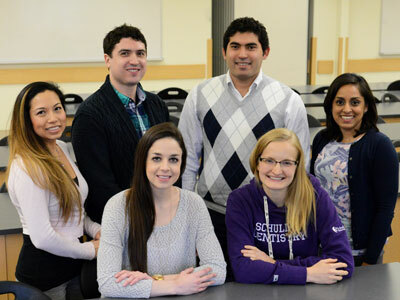 After dedicating countless hours to scientific innovation and discovery during the completion of their PhD degrees, second-year dentistry students Kim Beaucage and Erik Holm came to the realization that their current clinical studies could have a stronger focus on and incorporation of dental research. The two were determined to fill that void by bringing together a like-minded group of trainees with a common interest in dental research. The seminars and workshops are meant to supplement the training they already receive, and help bring their research efforts to the real world. They also focus on additional skills they will need to bring to the table throughout their careers, and what they think they can address during their own student-run events. In the short time that DART has existed, they have already hosted two successful events. The first was open to all dentistry trainees and featured Ivey Business School’s Mary Crossan, PhD, who discussed how to hone individual leadership skills. The second was a lunch and learn event that featured Dr. Jake Bartlett from McGill University who discussed translational research, innovation and industry, and entrepreneurship. The DART Board meets approximately once a month to discuss their future goals. Beaucage and Holm created the DART Group to bring people together to discuss new dental research ideas and to hopefully initiate potential collaborative research projects. Yara Hosein, PhD, a postdoctoral fellow currently working on dental research, agrees. She joined the DART board upon its inception and explained that it has been great working with dentistry students as a researcher, because it helps to provide information she doesn’t have with an engineering background. Schulich Dentistry has seen its fair share of dental research groups before, but Holm explained they usually last a few years then die out until someone wants to pick it up again. He and Beaucage believe that the DART Group will be successful by recruiting people who are consistently interested in research, and by creating more awareness of the Group amongst dentistry students. They are also developing a transition plan for the Group that includes members from different years and research backgrounds. “We just need to keep finding people who are just as passionate about dental research as we are. It’s how this Group will continue to thrive,” Beaucage said.